Ray Tomlinson died March 5 at the age of 74. Tomlinson invented email back in 1971 while working for a Boston company that helped develop ARPANET, the precursor to the internet. Email has been both a boon and a curse. While we love the ease and speed of communicating, we also have to constantly battle spam. Be careful of emails delivering harmful malware as attachments and greetings from Nigerian princes and other cons. The blessing and fault of email is that anyone can contact us through it if they know our email address. There has arisen a multitude of communication tools where we first have to approve or like someone, before they can communicate with us. That makes for cleaner communications. So now when I want to communicate with someone, I have to figure out their preferred contact app. For example, I know a young professional woman who responds just fine to email, but responds even quicker to a Facebook Messenger message. With Facebook Messenger, the message pops up on her phone’s screen instantly and makes a sound. If she’s free and my message is compelling, I get a response quickly. I in turn see it quickly and we can thus have a brief conversation and get the issue resolved in minutes instead of a day. With Facebook Messenger and the others, a person has to ask to be your friend before they can send you a message. This makes spam, phishing and emails trying to con you are all but eliminated. With Facebook Messenger you can also place phone calls. The calls do not eat into your minutes because the calls are carried entirely over the internet using VOIP or Voice Over Internet Protocol. So if you are on your home Wifi and the person you are calling is also on the internet, no one’s phone minutes are being consumed. My wife has been out of the country for the past couple of weeks, and she and I have found WhatsApp to be a great way to communicate. WhatsApp is owned by Facebook, which purchased it for $19 billion. It works like Facebook Messenger. While messenger is popular in the U.S., WhatsApp is phenomenally successful outside the U.S. Working over the internet, we can easily text one another without worrying about carrier texting costs on either end. The texts can contain photographs, something that standard carrier texting does not always support. The app also lets us make phone calls without using minutes. International calling and texting can cost. With WhatsApp we do not worry if her service or mine has international calling costs. The calls have had wonderful clarity. WhatsApp also has a web-based interface. My wife and I also have daily video calls using Google Hangouts. We could also use Skype, a Microsoft product. Both work well, as we discovered when she was visiting Indiana last summer and we did a lot of testing getting readying for her overseas trip. The quality is amazing and the cost is free, except of course for the cost of the internet. In the work environment, many now use Slack to communicate among teams. Slack allows everyone on the team to see the conversation. There are mechanisms for communicating publically, privately, to teams and to individuals. It lets users share files and comment on those files. It works both on the desktop and on phones. It maintains the conversation, so if someone joins a team late, they can see the conversation to that point. Search makes it easy to find past information as well. Slack can also be integrated with a lot of other tools, such as Dropbox, Hangouts, Twitter, Google Drive and many more. Slack requires you to approve a team member’s participation first, so no strangers can access your steams. There is a free tier to Slack, so it could be used by parents organizing children’s athletic teams or homeschool parents coordinating joint outs and learning opportunities, or any other group collaboration efforts we are involved in. This week’s link post has a link to a video explaining Slack. To Share this article on Facebook, Pinterest, Twitter and others, click the appropriate button below. Links for this week's column. 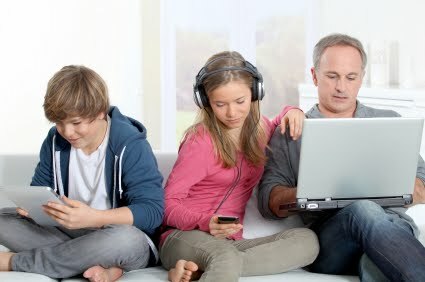 Like our Facebook Page to keep on Family Tech.